Sony MDR-ZX330BT Bluetooth Headphones allow you to connect to a selected smartphone with One-touch listening via NFC, then move freely without being encumbered by wires. Never be left without power with 30 hours long battery life, and enjoy speed charging when you need it most. 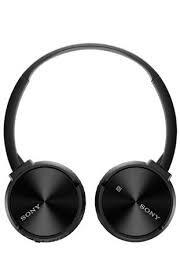 The headphones include separate volume control, and adjustable headband, 30mm driver and a 6.3mm adaptor. Hire headphones for your next event today from ITR.